Are you looking for fun ideas for a moms night out in November? These little-known November holidays provide plenty of reasons to gather your best mommy friends for a fun moms night out. With Christmas parties starting soon (or perhaps already underway) this may be the last time you’re able to get your mommy friends out for a fun night before the new year. November 3rd – Sadie Hawkins Day: Sadie Hawkins Day is a fun day that recognizes what used to be called “role-reversal” where girls take control and ask the boys out. It’s not so uncommon these days for women to ask out men but it’s still a fun holiday to celebrate with your best girlfriends. No, I’m not suggesting all you married mommies go out and ask out other men…but perhaps you & your best girlfriends could gather for a fun night of watching movies with gorgeous men or gossip about celebrity crushes. November 11th – Origami Day: Do you know how to make origami? Some people make it look so simple, but I’ve never caught on to it. You & your best mommy friends could gather over treats with an origami book and see what creations you can make. November 14th – Loosen Up, Lighten Up Day: Most of us need a reminder to “lighten up” at some point in our lives. Today is a great day to celebrate & let your hair down with your best girlfriends for a fun night out (like a comedy club). November 14th – International Girls Day: This is a great day to gather your best girlfriends for a spa date, lunch or a movie. November 25th – Shopping Reminder Day: Christmas is only a month away from National Shopping Reminder Day! You & your best girlfriends could gather your holiday shopping lists, meet at the mall and split up to do some holiday shopping. You could then meet up again at a mall restaurant for supper & to review the gifts you purchased. 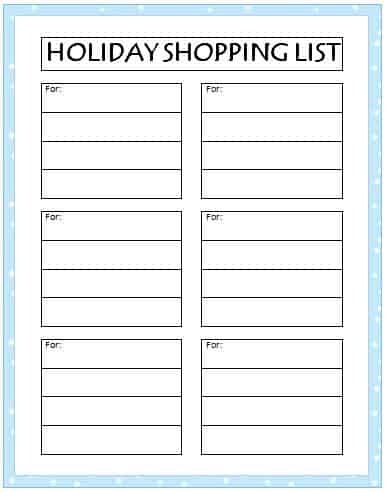 Here’s a simple holiday shopping list that you can print & fill out before your mall trip. This way you won’t forget who to buy for or what to buy. Which of these little-known November holidays will you be celebrating? Looking for more little-known November holidays? Check out Brownielocks.com – she has a huge list of holidays for each month. For more fun ideas for a moms’ night out, visit our special Moms’ Night Out page. Follow along on Facebook, Twitter, Pinterest and Bloglovin’ for even more fun ideas! What great ideas! I might have to get a girls dinner going to celebrate International Girls Day!! I didn’t realize there were so many ‘holidays in November! I think I’ll participate in Shopping Reminder day with my besties. I might do the origami day with my kids!! They would get a kick out of that! Ooh, I am SO celebrating National Origami Day!